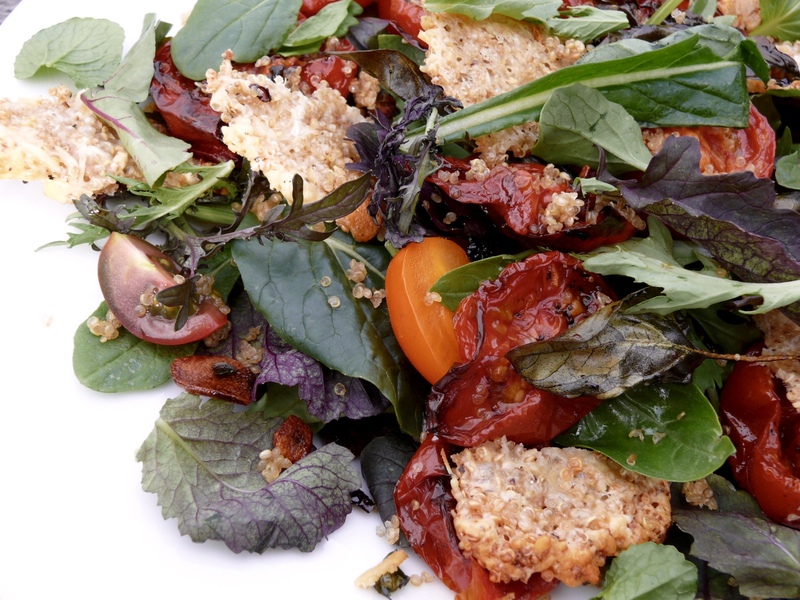 This is part two of my pot of quinoa, multi tasking for the week (see last weeks http://freshkitchen.co.nz/roast-quinoa-and-tomato-salad-with-quinoa-and-parmesan-wafers/). 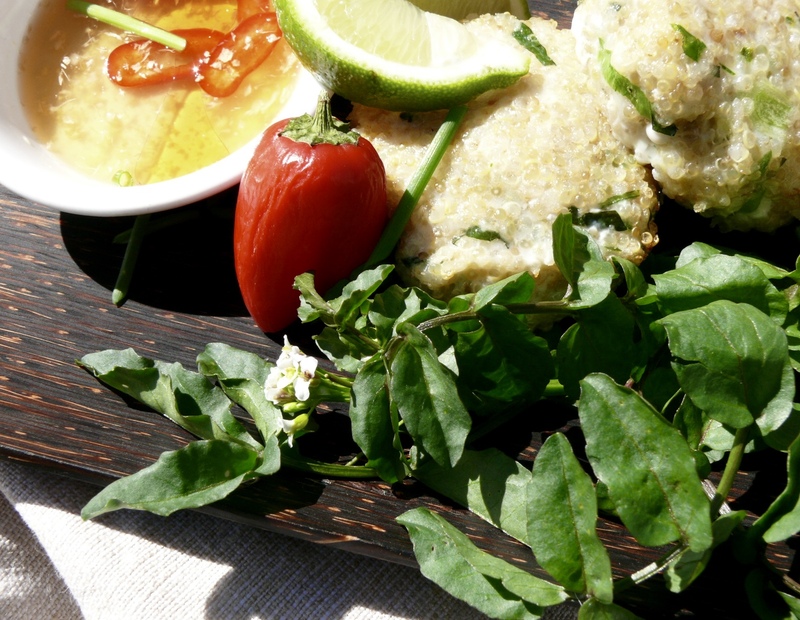 These fish cakes in themselves are pretty multi tasking and delish. They are light, healthy, tasty, and depending on your choice of white fish very economical. 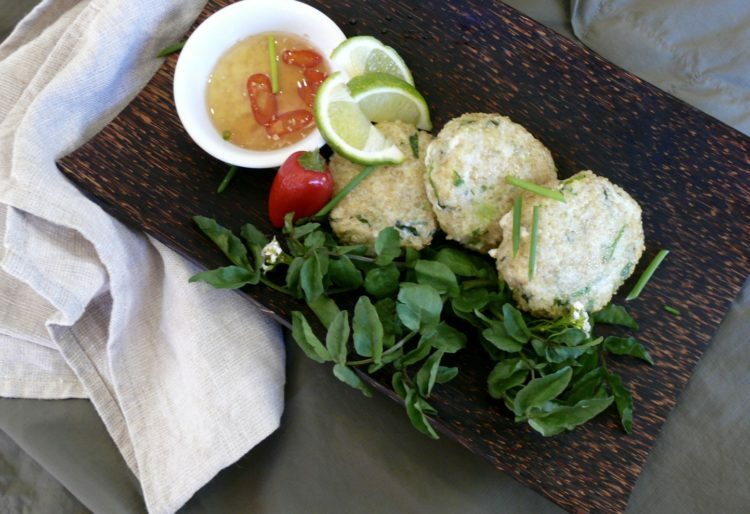 I have served them both as a canapé and as a main course with a salad, and frozen then before cooking and later cooked them very successfully!!! 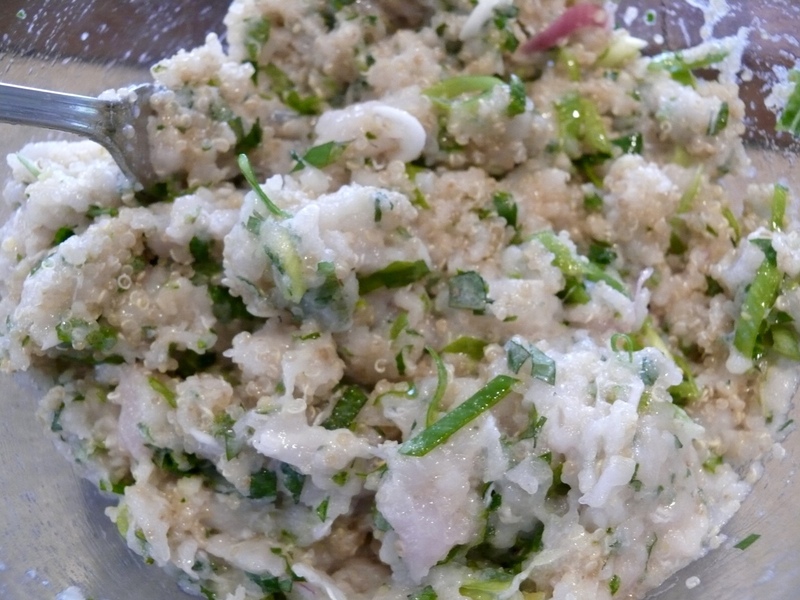 I used a food processor to chop the fish and herbs finely but I am very confident that this could all come together just as easily with a good sharp knife or mezzaluna, and probably get a fishier texture as well (I will try this). As always use the Asian herbs you have to hand, I am very conscious that a lot of people have a low tolerance for coriander and though I would happily add it by the bucket load I have found lots of good alternatives. My favourite alternative is vietnamese mint which even in Queenstown grows seasonally well in a shady moist spot. My other go to ingredient are kaffir lime leaves, which also grows well here as long as I keep the shrub in a tub and bring it indoors for the winter. Apart from these aromatics ginger, lemon grass, mint and fresh turmeric are readily available and are interchangeable in this context (turmeric will add colour but added goodness as well, it depends if it seams important to you to keep the white look at the time). 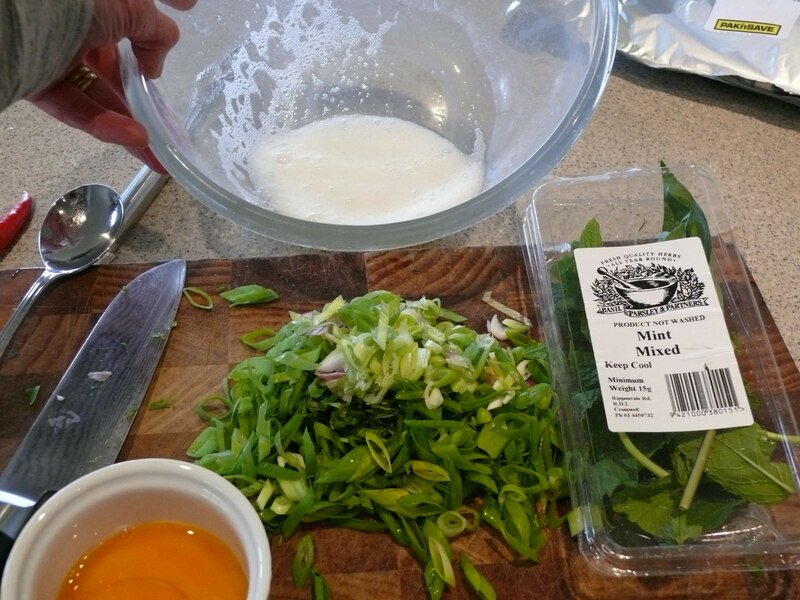 I started with the food processor chopping the kaffir lime leaves, lemongrass and ginger and fish sauce as finely as I could. I then added the fish and pulsed carefully till I had a fairly fine even textured mix, you may need to stop and push mix together between pulsing to get an even texture without taking the mix to a complete paste. 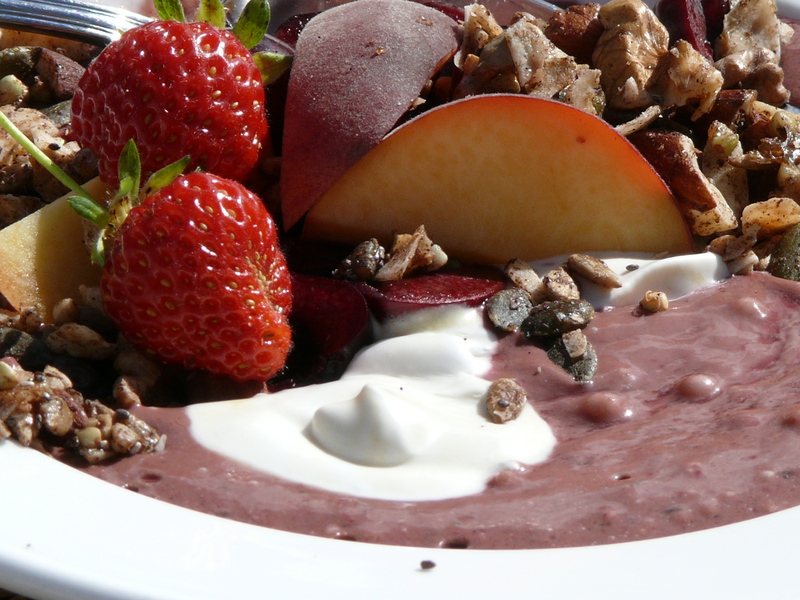 Next in my largish bowl, I lightly whisked my egg white to a soft peak foam. 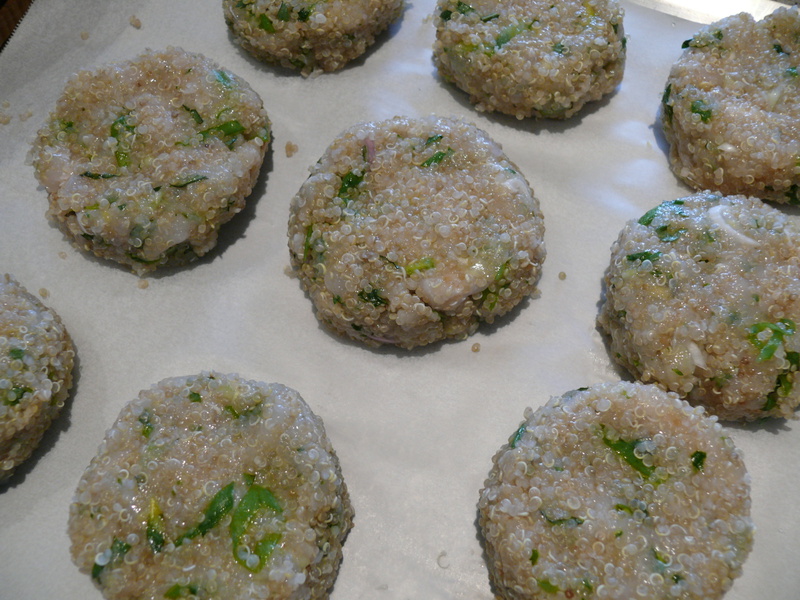 Then I added the fish mix, all the chopped herbs, spring onion and gently mixed everything together. 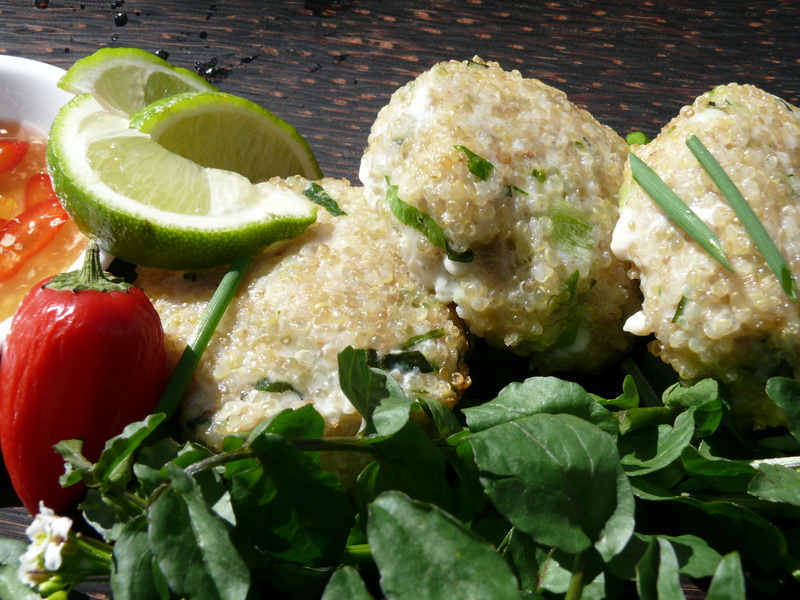 For the fish cakes measure large spoons of mix, about 1/3 cup for dinner size, or as small as you like for canapé size and roll them gently in the extra quinoa putting these on lined baking tray as you go. Brush them generously with olive oil and bake for about approximately 6 minutes then turn them over and bake another 6 minutes until golden and crisp. Take care not to over cook as they will easily turn a little rubbery rather than delicate. This looks awesome. Currently drooling. Fish shop tomorrow.